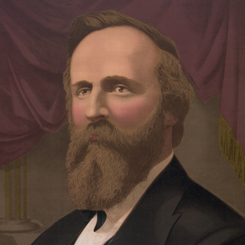 Image courtesy of Library of Congress A Civil War veteran, Rutherford B. Hayes of Ohio began his political career as a one-term Representative to the House. On this date, a Joint Session of the 44th Congress (1875–1877) met for the first time to count the electoral votes in the 1876 presidential election. Democrat Samuel Tilden had emerged from the close election leading Republican Rutherford B. Hayes of Ohio, just one vote shy of the 185 needed to win. However, returns from Louisiana, Florida, South Carolina, and Oregon remained in dispute. The southern tallies were particularly controversial. Both Tilden and Hayes electors submitted votes from these three states, each claiming victory in violent and confused elections. The Democratic controlled House and the Republican dominated Senate came to a compromise on how to resolve the problem by creating an Electoral Commission: a bipartisan committee of House Members, Senators, and Supreme Court Justices who would determine the final disposition of the yet-unassigned electoral votes. The February 1 Joint Session first put the commission to work, submitting the Florida returns for investigation before a large crowd in the gallery. “There was a great desire to witness a fair count,” reported the New York Times, “and curiosity was increased by the expectation that the new law would afford some new diversion to the formality of the counting.” Congress met in a Joint Session 15 times in the next month, until—acting on the decision of the commission—it awarded the disputed vote to Hayes, granting him the victory by one vote.